On January 11, 2017, Thomas McCormack, Regional Sales Manager for Uniweld Products Inc. was the guest speaker to the American Welding Society (AWS) Florida West Coast Section meeting held in Brandon, Florida. Uniweld Products, Inc. is a Fort Lauderdale, Florida U.S.A. based company with a sales force in both domestic and international market. Uniweld is a forward thinking company with modern developments in manufacturing and a customer care system built around relationships. The 'Built in the U.S.A.' spirit runs deep. Thomas McCormack joined Uniweld at more than 15 years ago. Being a long time member, now life time member of AWS, Thomas McCormack has brought his many years of valuable knowledge and experience in welding machinery, consumables and gas apparatus industries to Uniweld's sales force. The presentation included a display of Uniweld's made in the U.S.A., straight cutting torches as well as an introduction to Uniweld's Ameriflame product line. The membership was active with questions about Uniweld and its history. Thomas McCormack was very informative about the company as well as all experience in the welding industry dating back to 1970. The attendees were well entertained with stories of the business. Thomas McCormack also offered help in job placement questions to some of the student attendees. Education in the welding industry is of empirical importance for furtherance of the American Welding Society and the future challenges of modern infrastructure growth. Uniweld Products, Inc. has manufactured quality welding and cutting equipment at its factory located in Fort Lauderdale, Florida U.S.A. since 1949. Refrigeration manifolds & hoses, vacuum pumps, tubing tools, nitrogen kits, cutting torches, welding handles, cutting attachments, pressure regulators, pressure gauges, cutting tips and welding tips are among the products manufactured at Uniweld's factory in Fort Lauderdale. Uniweld.....”Quality Tools That Go To Work With You®." 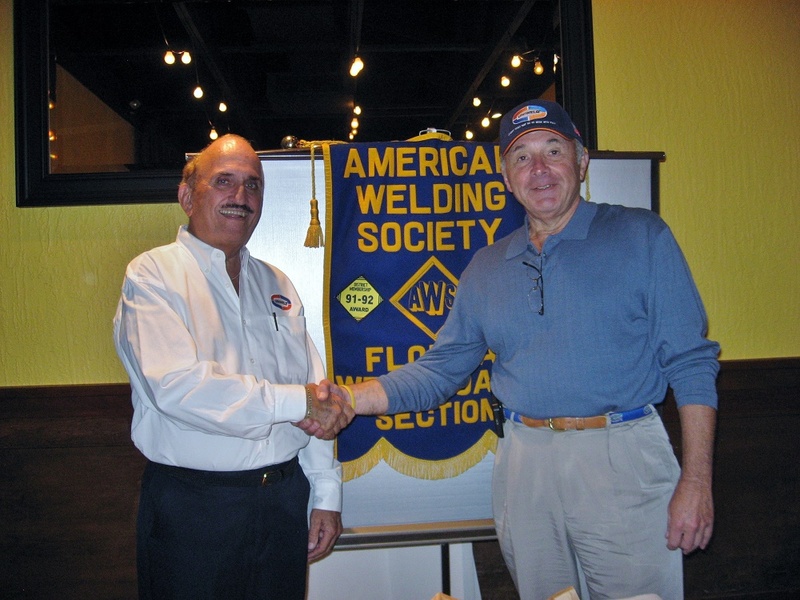 Uniweld Regional Sales Manager, Thomas McCormack with AWS West Florida Section Chairman, Al Sedory Uniweld Products, Inc.